Your browser doesnt support this video format. Do you know Madi Sharma? Or know of her? Have you heard about the phenomena known as the ‘Madi Effect’? Have you received a ‘Commitment Bead’? When I asked around, different people gave me differing definitions of their understanding of the ‘Madi Effect’. Someone called Madi a ‘human magnet’, others said, ‘A tsunami of energy’, or ‘I carry her bead with me everywhere’, or ‘I have heard her speeches three times and I can’t wait till she speaks here again’. I call her a wake-up call that every individual should receive at least once in their lives which is why I asked Madi if we could write a book together to empower human capital globally. And I never thought she would insist my name went on the front cover! Madi is an Entrepreneur who founded and runs the Madi Group, a group of private profit making companies, social enterprises and not for profit organisations. The philosophy is to create innovative ideas tailored to local action which can achieve global impacts beneficial to economically, socially, culturally and environmentally sustainable societies. Madi is a “Social Capitalist”. Madi’s story is one of ‘Victim to Change maker’ as her personal journey has taken her through the University of Life where she experienced domestic violence, sole parental responsibility and Entrepreneurship. She established her first company from her kitchen at home, which grew to 2 factories and 35 staff. She has received the honours of Asian Woman of Achievement and UK’s Best Boss. Madi is a recognised public speaker internationally, particularly in the field of Entrepreneurship, female Entrepreneurship, diversity, gender balance and her passion for corporate social responsibility CSR. Her presentations, spoken from the heart, motivate, inspire and seek to make others consider their ability to affect change. She presents and teaches in schools, universities and to forward thinking businesses and organisations. Additionally, Madi is a member of The European Economic and Social Committee in Brussels, a Prime Minister’s appointment, representing the Employer’s Group. The Committee is a consultative body of the European Union and a foundation of EU policy development. I would not change my life with anyone else on this planet. We all have a reserve of energy, will power and commitment, but sometimes we need to find the source of what triggers it into action. MNE is a book about being ‘Focused’ and no matter what happens, it is about putting on the ‘Face’ that says you know what you are doing because you have an ‘Absolute Commitment’ in life. It is not money that is the true capital in the world – It is the ideas from our brains – It is the Human Capital that we must maximize by turning ideas in to action and valuing people! We all know there is no “I” in Team, and the “I” in MADI means: ‘I’ take responsibility for everything. Today my point of differentiation is ME – I have understood that I am not like anyone else on the planet. I am unique. And that is the way I wish to stay! Shariqa Habib is the co-author/intern of Madi No Excuses! She has been a part of the Global Changemakers network since 2009 through which she founded "See the World Through Our Eyes" in Malaysia, a project for Burmese refugee children living in Kuala Lumpur. She was also the co-founder of World Bank Institute community action project (WBICAP) – "Corruption is Not an Option" which created a virtual platform for the youth of Bangladesh to address corruption. As part of her master's program, she is conducting a research internship with International Labour Organization (ILO) Bangkok, she will graduate in June, 2017. Heena was Madi Group’s first employee! She created the Madi Group by supporting Madi to build new companies and support more women. Heena has established her own companies MRS Business and OPC under Madi Group support. Madi No Excuses is a book Heena has been insisting Madi writes for the last 5 years because she wants to share Madi with India! Monika is Madi No excuses artist and illustrator who is committed to adding something authentic and positive to the world of art. She is always developing and challenging herself artistically. Monika's work has been classified as energetic, warm, colourful and very diverse. These traits are a strong reflection of her personality. Her vibrant compositions, most produced directly on canvas, are drawn from her urban surroundings, a plethora of music and art as well personal experiences. Julijana is a brand communicator at Madi Group and technology translator! For Julijana working with Madi is a great challenge as she sees potential in all those Madi Group work with and Julijana's role has been to promote what Madi Group is doing and very often be the Foundation for Madi when it comes to technology support. Vasil agreed to be the printer and designer of the first edition of Madi No Excuses! because he attended one of Madi’s workshops in Skopje, where he said her speech had changed his life. Vasil has dedicated his experience and passion into making the book and its cover represent everything included in the book. 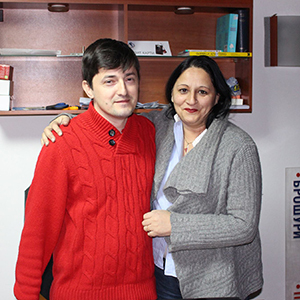 Vasil is an Entrepreneur, who successfully run offset print house Pro Dizajn in Skopje, Macedonia. With the economic crisis and lack of job opportunities around the world, entrepreneurship is on the up rise. Social entrepreneurship has never been more valued, more needed and more achievable than it is today but yet this term remains unknown to too many people. A group change makers from Iceland have decided to make an inspirational and enlightening documentary about this important phenomenon. The film focuses on a very special social entrepreneur, Madi Sharma, who wants nothing more than to spread out what she believes in. Madi is one of those people you meet in life and always remember. Like most social entrepreneurs she's obsessed by her ideas and has committed her life to changing the direction of her field. She is a visionary and a mass recruiter of local change makers - a role model encouraging that citizens who channel their passion into action can do almost anything. One of the group members describes her encounter with Madi: ''She is without a doubt the most inspirational person I've ever been in contact with. I remember very strong feelings inside of me that were screaming: "Her voice, message and philosophy must be heard in more places." I want people to get the same tingling motivating feeling inside as I got when I heard Madi talk''. There are many people that aren't aware of the power they have, within themselves and the options and opportunities they have to change their society. The purpose and aim of the film is to enlighten, spread and awake interest in the term and phenomenon social entrepreneurship as well as to awake motivation within the audience. For we need drive and inspiration to be able to make change. Thank you so much for your lecture this afternoon. It really was a fantastic way to round out the course. The feedback I'm getting from the students already is incredibly positive. You have touched lives. I was in your lecture yesterday: I had lumps in my throat as you grew emotional during the speech. And yes I am a man but I find it just human to feel like that. It was a truly moving lecture and so much like and unlike other lectures delivered by other guest speakers. Like them because it was to encourage the young to be ambitious and not to give up; and so much unlike them because it chose to target initially the heart and then the mind of the audience. It worked; well, it worked for me. You said you are happy if your presence can change the life of at least one; well it can bring change to mine. However as I know you have a lot to do I'll only bring it to your attention if you think you want to hear about it. Thank you again for the very sincere lecture you delivered yesterday. First of all I have no enough word to express my admiration about your life philosophy and the things you choose to do in your life. I personally think that local actions and initiatives are the future for our civilization because we every day see examples of things going wrong because of the money-oriented system we are all into. Deep and sincere thanks for your kind words, and let me just say HOW MUCH your contribution was appreciated by the participants who came together in the conference room, with different interest, priorities and experience, and who had such an inspiring exposure to the women's entrepreneurship agenda due to your presentation! You have greatly contributed to the success of the conference, and thank you so much for investing your outstanding personality, passion and for charging the participants of the conference with your positive energy! Moreover, your speech has generated a "storm" of tweets on internet, while you were still speaking and of course after! You really touched the hearts and the minds! All students appeared completely engrossed in your talk. This was naturally reflected when we analysed the feedback forms – You were the most popular speaker among participants. Congratulations! It was a pleasure to meet you in Pula. The general impression of all participants during all these days show unanimous enthusiasm, so you did a great job. You changed the public entrepreneurial opinion. Your speech was just excellent and perfectly swashbuckling: you're probably one of the best speakers I've ever heard and you highly contributed to make this Summit a success. Your workshop actually gave me the understanding, that there is room for business-doing from a broader point of view over life, and for the unwritten broader rules of universe). Up until now I just felt that I am "different", and cannot comply with my surrounding. It was a pleasure to meet you and, above all, listen to your speech. I'm sure you have received thousands of greetings for this, but once again I would like to stress how critic, intense, accurate and CORRECT it was.